If you think you are having a bad day, think again. 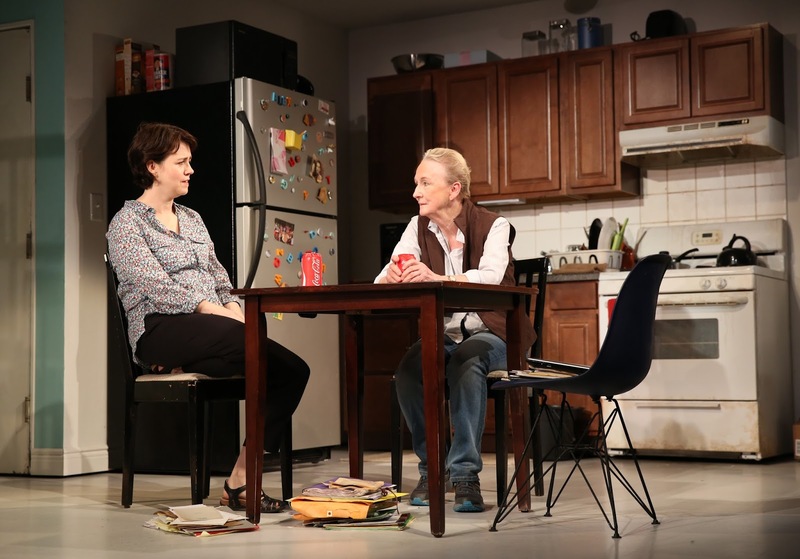 Most of us can't imagine a day like any of those Mary Jane is having in the world premiere of Amy Herzog's poignant play and we probably wouldn't handle them with as much grace or optimism. Mary Jane (an excellent Emily Donahoe), you see, is a single parent trying to balance caring for her extremely handicapped son, Alex (never seen), while trying not to eat up all of her sick and vacation days as an administrative assistant -- a job her sister's friend gave her out of sympathy, but which Mary Jane was happy to take for its medical benefits. Alex needs full-time care and while, some caregivers, like Sherry (Shona Tucker) go above and beyond, some refuse to take the case at all because it is "too hard." Others slack off and cause Mary Jane to miss work or sleep to make sure her son is being fed through his tube and not choking. What emerges from an oppressive situation, smacking us in the face with its unexpected recurrence, is an unwavering positive attitude from Mary Jane. If anyone has a right to be down, it's she. Her husband couldn't face the future when Alex was born prematurely at 25 weeks with cerebral palsy and other issues and left her to deal with the reality alone. But her coping looks different from what you might expect. Instead of cursing her life (like Job was encouraged to do), Mary Jane is a beacon of optimism for the women with whom she interacts. Sherry's young niece, Amelia (Vella Lovell), asks a lot of questions, which Mary Jane cheerfully answers. Brianne (Miriam Silverman), a new mother of a child with special needs, gets helpful advice about how to cope and shortcuts for how to get what she needs from the system. 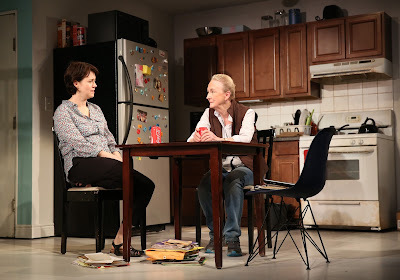 Mary Jane gets some assistance from other women in her circle as well, like building superintendent Ruthie (Kathleen Chalfant) who provides practical help, like unclogging the sink, but who isn't able to provide much emotional support. That comes from Chaya (Silverman), another mom of a special-needs child, who well understands the long stints in the hospital (Laura Jellinek's versatile set switches to this location from Mary Jane's apartment) and Tenkei (also Chalfant), a compassionate Buddhist nun and the hospital's chaplain on call. From Chaya and Tenkei, Mary Jane tries to glean some religious wisdom which can help her through the journey which her doctor doesn't think she fully understands -- it's not a journey to bringing Alex back home, it's the end of the road for her son whose health is deteriorating. In a way, realism translates into surrealism and we're not always sure which is the better way to go. Mary Jane's propensity to cope -- except for one moment when she expresses her frustration when a music therapist fails to arrive to work with her son -- is extraordinary and a lesson for those of us who would complain about a lot less. Circumstances happen, but it is how we react to them that can make all the difference. Mary Jane's ability to see beauty, even in a migraine, is inspiring. Often there are murmurs of agreement from the audience as some truth is expressed. It's an eloquent piece which makes some big statements without speeches, but in the development of an extraordinary, unusual character. 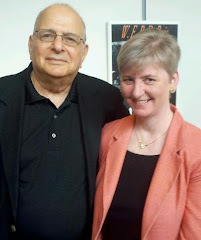 Donahoe, under the direction if Anne Kauffman, who also helmed Herzog's Belleville at Yale) is sensational, communicating the depth of Mary Jane's feelings often in a simple expression or tone of voice. It's hard to believe we know her so well in the five months that span the play. The supporting cast all double in roles made distinguishable by Costume Designer Emily Rebholz and Wig, Hair and Makeup Designers J. Jared Janas and Dave Bovas. Mary Jane plays through May 20 at Yale Repertory Theatre, 1120 Chapel St., New Haven. Tickets are $12–$99: yalerep.org; 203-432-1234.